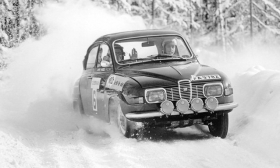 Saab model 96 from a 1969 rally race in Sweden. After attempts were made by various Chinese companies to bail it out of debt, Saab formally filed for bankruptcy this week. The company has not produced any cars since it ran out of cash in April, but its quirky design and marketing always stood out. Saabs had the ignition key slot on the floor rather than behind the steering wheel. The windshield mimicked a letter box. The bumpers "repaired" themselves. The dashboard was lit green. The exhaust note from the turbo engine resonated like the burble of a motor boat. 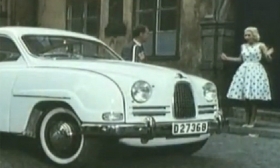 The eccentricities of Saabs were emphasized rather than masked, in the slew of print, and later, video, advertising campaigns that were mounted in the U.S. market, where the odd-looking Saab first went on sale in the 1960s. Some of the more memorable Saab taglines and slogans were "Born From Jets," "We don't make compromises, we make Saabs" and "Find Your Own Road." Throughout the '70s and '80s, Saab -- which was often mentioned in the same breath as Volvo, since both were Swedish imports -- formed various alliances, including one with Fiat, and dipped a toe in the luxury market with the Saab 9000. The Saab 900, which came out in 1978, was one of the company's most successful products, selling more than a million units. General Motors bought into the company with a 50% investment in 1990, after which GM shored up Saab by sharing significantly into technology. GM purchased the remaining interest in 2000 but sold it to a Dutch firm, Spyker, in 2010. 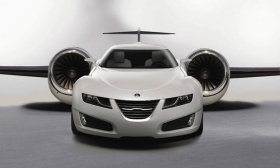 Among the agencies that worked with Saab after the company was taken over fully by General Motors in 2000 were McCann Erickson and Lowe New York, which created the "Jets" campaign. 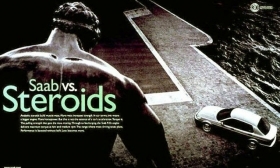 One of Saab's more expressionistic magazine ads took on steroids. 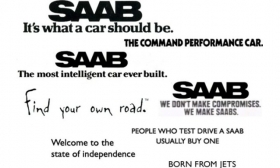 A collage of some of the more memorable Saab marketing taglines and slogans over the years. 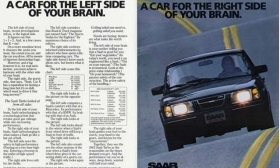 Left side is rational, right side is emotional; Saab in this ad satisfies the entire brain. A graphic interpretation of the "born from jets" theme.